This new drama by Frederic Colier (The Proposal, Heartbreak Tango, The Undertaking) and directed by Codie K. Fitch (The Proposal, Icarus, Isle of Joy, Rosemary with Ginger, Amoré e Veleno, Forgivable Sins, Papa Padowski) follows an unemployed middle-aged man on his way to selfhood, clashing against the world surrounding him: his family. The play is published by Book Case Engine. 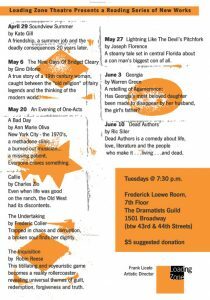 The reading took place at the Dramatists Guild. May 2003. 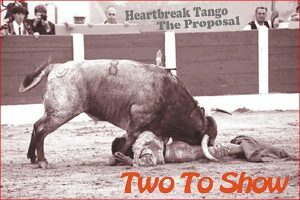 Altered Ego Entertainment presented “Two To Show,” an evening of two one-act plays at the Producers’ Club, NY. 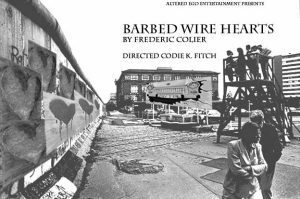 The production featured two plays by Frederic Colier: “The Proposal,” directed by Codie K. Fitch and “Heartbreak Tango” directed by Robin Reese, with Stefanis Bubnis, Timothy Davis, Christa Mountain, Michael Williams, and Jason Williams. Stage manager, Max Weinstein; Sound, Ann Shapiro; Lights, Spencer Chandler; Set, Meghan Cilley; Music John Hedges; ASM, Nicole Catalano & Amy Lui. 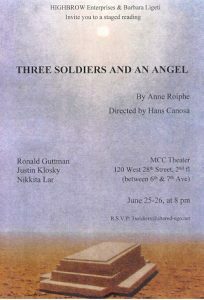 “Three Soldiers and an Angel,” is a new play by Ann Roiphe. The play is controversial for both its timing and subject. The play follows the Angel of Death as he wanders through the ages to announce a Jewish Soldier wounded on the French soil during WWII, a young Jewish slave in Masada during the Roman Empire, and an Israeli soldier in the street of Hebron, that their time has run out and they must give up their life. The cast includes Ronald Guttman, in the “Angel of Death,” with Justin Klosky and Nikita Lar. Directed by Hans Canosa. 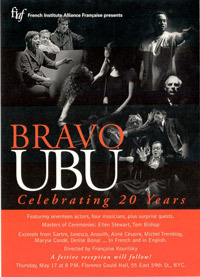 “Bravo UBU, Celebrating Twenty Years,” traces Ubu Repertory Theater’s twenty-year of productions since its first days in New York. Directed by Françoise Kourilsky, the evening was a compilation of the best moment of Ubu’s repertory and featured excerpts from Sartre, Ionesco, Maryse Condé, Denise Bonal, Aime Césaire, among many others. 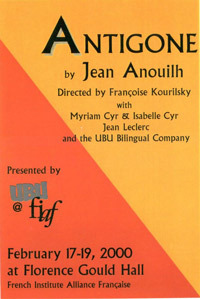 “Antigone,” by Jean Anouilh with the Ubu Bilingual Company. Directed by Françoise Kourilsky at FIAF, the play departs from the Sophocles’s original. The play makes a sharp comment on the nature and good and evil during the French occupation. Lights by Greg MacPherson. Costumes by Carol Pelletier. Stage Manager Karen Wray. With Carlos Arevalo, Myriam Cyr, Jacqueline Bertrand, Isabelle Cyr, Dominick Aries, Jean Leclerc, Simon Fortin, Morgan Dowsett, and Michael Bradley Griffith. 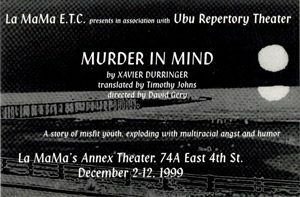 “Murder In Mind,” by Xavier Durringer. A story of misfit youth, exploding with multiracial angst and humor. Translated by Timothy Johns. Directed by David Gery at La MaMa Theater. Set by Watoku Ueno. Lights by Greg MacPherson. Costumes by Carol Pelletier. Sound by Robert Gould. Casting by Paul Russell. With Willie C. Carpenter, Chris Edwards, Zabryna Guevara, Michael Medico, Jacinto Taras Riddick, and Heather Robbins. 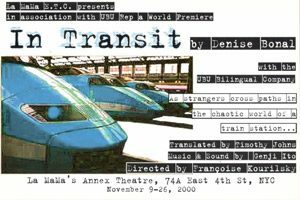 “In Transit,” by Denise Bonal with the Ubu Bilingual Company. As strangers cross path in the chaotic world of a train station . . . Translation by Timothy Johns. Directed by Françoise Kourilsky at La MaMa Theater. Music & sound by Genji Ito. Set by Watoku Ueno. Lights by Greg MacPherson. Costumes by Carol Pelletier. Stage Manager T. Dente. With Tatiana Abbey, Jacqueline Bertrand, Myriam Cyr, George Demas, Simon Fortin, Michel Moinot, Genevieve Schartner, Brian Sloan, Carlo Trigiani, Zishan Ugurlu.